I think this is the first time I've ever reviewed anything funky. I'm a long time fan of Parliament/Funkadelic and the Red Hot Chili Peppers though. Bootsy man...Bootsy. He plays funk and appeared on numerous albums by Buckethead. As I'm in "Not So Much Death Metal July," I decided to take a look at this album that they were kind enough to send me. 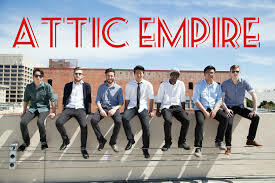 Attic Empire are a seven piece astro funk ensemble. Honestly, I'm not entirely sure what that means, aside from that meaning there's a lot of them. Take a look, there's tons of them! I mean literally, bet that if you weighed all seven members of the group, they would weigh more than 2000 total pounds. Anyone looking for serious music, i.e. something that will make you feel ways about things, had better find something else. 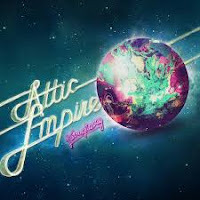 Attic Empire's EP is all about the fun, the funk, and the groove. There are no serious issues discussed or talks about feelings. The vocals are nearly reggae and blend into the luxurious music. The horns, the guitars, the drums, it all adds up to a great listening experience. I'm a big fan of funky grooves, not so much with reggae-type vocals, but I'll give this a listen. Have you heard Galactic?